Levels of complement proteins — proteins of the immune system — may predict disease activity in patients with hereditary angioedema with C1 inhibitor deficiency (C1-INH-HAE), according to Japanese researchers. Their study, “The relationship between complement levels and disease activity in Japanese family cases of hereditary angioedema with C1-INH deficiency,” appeared in the journal Allergology International. The complement system is a part of the immune system with a crucial role in inflammation and in the defense against some bacterial infections. Type 1 HAE is caused by mutations in the complement C1-INH gene, which results in deficient C1-INH levels. This protein prevents the activity of complement component C1 and other enzymes involved in clotting. 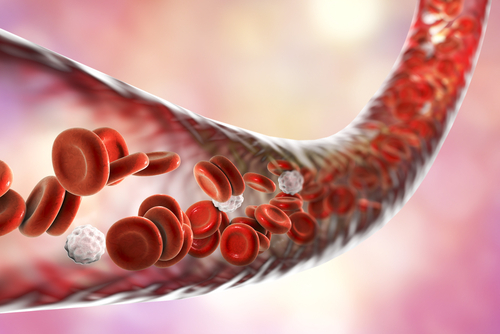 Despite studies on the relationship between HAE attacks and levels of small proteins involved in clotting, there’s been limited research exploring the link between disease severity, activity of C1-INH-HAE, and complement parameters. In particular, no studies have analyzed these correlations in Japanese C1-INH-HAE patients, the investigators wrote. To address this gap, researchers included eight type 1 HAE patients from three Japanese families. All patients had a family history of C1-INH-HAE and decreased levels of C1-INH. Based on existing recommendations, the scientists screened all family members of diagnosed patients. These recommendations are expected to counteract the decreased quality of life associated with delayed diagnosis and risk of an HAE attack without appropriate treatment. Genetic mutations were found in three distinct regions of the SERPING1 gene. Researchers then collected blood samples during symptom-free periods without medication to measure levels of functional C1-INH, as well as other complement parameters. The severity and number of HAE attacks over the previous five years were assessed through medical records and self-assessment of patients and family members. HAE attacks involving the face, neck, abdomen, or upper airways were defined as severe, while subcutaneous (under the skin) attacks were defined as mild. Among the complement proteins tested, serum levels of C4 were below the normal range in five of the eight patients. The remaining three patients were asymptomatic throughout their life. As with previous studies, this result indicates that an HAE diagnosis cannot be excluded by normal levels of C4, the scientists said. Lower-than-normal levels of CH50 were detected in four patients, including all patients with past HAE attacks. The three patients with levels of functional C1-INH higher than 30 percent were asymptomatic and had normal C4 levels. Researchers found that patients with symptoms of HAE had reduced levels of functional C1-INH, C-INH antigen (the protein that binds to C1-INH), C4, and CH50, compared to patients without symptoms. The higher the levels of these complement parameters, the lower the number of past severe and mild attacks. “The results of this study suggest that serum levels of functional C1-INH, C-INH antigen, C4, and CH50 during symptom-free periods might be useful as predictive parameters of type 1 HAE disease activity,” the researchers wrote. However, the small number of cases limits the findings’ applicability, the scientists cautioned. Tagged C1-INH, C1-INH antigen, C4, case series, CH50, disease activity, functional C1-INH, HAE attacks, HAE type 1, hereditary angioedema.